Buy online STP80NF10 Power MOSFET in India at low price from DNA Technology, Nashik. 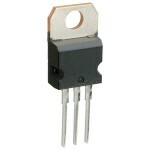 This Power MOSFET series realized with STMicro electronics unique STripFET process has specifically been designed to minimize input capacitance and gate charge. It is there fore suitable as primary switch in advanced high efficiency isolated DC-DC converters for telecom and computer application. It is also intended for any application with low gate charge drive requirements.